Thursday, 45 national security experts, many of whom held senior positions in the nuclear weapons, arms control, nonproliferation and intelligence fields, sent a letter to President Trump urging him to withdraw the United States from the deeply flawed 2015 nuclear agreement with Iran (the JCPOA) using a comprehensive plan drafted by former U.S. Ambassador to the United Nations John Bolton. The signatories believe President Trump was exactly right during the campaign when he said the JCPOA is one of the worst agreements ever negotiated. They believe this agreement is dangerous because it allows Iran to continue its pursuit of nuclear weapons while the deal is in effect, has extremely weak verification provisions, and ignores Iran’s increasingly destabilizing behavior. Because of the enormous risks the JCPOA poses to American and international security and the impossibility of convincing Iran to amend the agreement, the signers believe the only option is for the United States to withdraw and initiate a new, more comprehensive approach that addresses all of the threats posed by Iran – including its missile program and sponsorship of terrorism – with a broad alliance that includes Israel and America’s Gulf State allies. The signatories endorse Ambassador Bolton’s plan to implement this approach by withdrawing from the JCPOA in coordination with America’s allies. The signers believe the Bolton plan is the best way to reverse the damage done by the reckless concessions that Obama officials made to Iran to negotiate the JCPOA and to prevent the Iranian nuclear program from spinning out of control as North Korea’s nuclear effort has. The full text of the letter and list of signers are below. We are writing to you as national security experts, many who worked in the nuclear weapons, arms control, nonproliferation and intelligence fields, to express our strong opposition to the 2015 nuclear deal with Iran (the Joint Comprehensive Plan of Action or JCPOA) and to ask that you withdraw the United States from this dangerous agreement as soon as possible. We also call on your administration to declare to Congress next month that Iran has not been complying with this agreement and that it is not in the national security interests of the United States. We strongly supported your statements during the 2016 presidential campaign that the JCPOA was one of the worst international agreements ever negotiated and as president that you would either withdraw from or renegotiate this deal. Your campaign statements accurately reflected that the JCPOA is a fraud since it allows Iran to continue its nuclear weapons program while the agreement is in effect by permitting it to enrich uranium, operate and develop advanced uranium centrifuges and operate a heavy-water reactor. Such limited restrictions as the deal actually imposes on Iran’s enrichment program will expire in eight years. In addition, the JCPOA’s inspection provisions are wholly inadequate. We also note that a joint July 11, 2017 letter to Secretary of State Rex Tillerson from Senators Cruz, Rubio, Cotton and Perdue outlined significant violations of the JCPOA by Iran, the most important of which is Iran’s refusal to permit IAEA inspections of military facilities. In addition, although the JCPOA did not require Iran to halt its belligerent and destabilizing behavior, President Obama and Secretary Kerry repeatedly claimed it would lead to an improvement. This has not happened. To the contrary, after the JCPOA, Iran’s behavior has significantly worsened. Tehran stepped up its ballistic missile program and missile launches. There was a 90% increase in Iran’s 2016-2017 military budget. Iran has increased its support to terrorist groups and sent troops into Syria. Harassment of shipping in the Persian Gulf and Red Sea also increased, including missiles fired at U.S. and Gulf state ships by the Houthi rebels, an Iranian proxy in Yemen. Moreover, in light of major advances in North Korea’s nuclear program, we are very concerned that North Korea and Iran are actively sharing nuclear weapons technology and that Iran is providing funding for North Korea’s nuclear weapons program. CIA Director Mike Pompeo suggested this possibility during a September 11 Fox News interview. We are unconvinced by doom-and-gloom predictions of the consequences of a U.S. withdrawal from the JCPOA. The sky did not fall when you withdrew the United States from the Paris Climate Accord. Claims that Iran will step up its nuclear program or engage in more belligerent behavior must be considered against the backdrop of what Iran is allowed to do under the JCPOA and its actual conduct since this “political understanding” was announced. Some Iran deal advocates argue that the United States should remain in the JCPOA and instead try to amend it to fix its flaws over several years. A few contend you could decertify the agreement to Congress, but remain in the deal and then try to amend it. Since Iran has made it clear it will not agree to changes to the JCPOA, we believe these proposals are unrealistic. Continuing to legitimate the agreement is not conducive to its renegotiation. The day will never come when the mullahs agree to amend the sweetheart deal they got in the JCPOA. 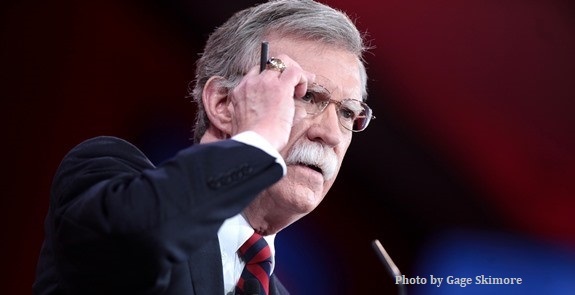 Ambassador John Bolton has drawn up a plan to implement a far more effective, comprehensive and multilateral approach to address the threat from Iran. This approach includes strict new sanctions to bar permanently the transfer of nuclear technology to Iran. He also calls for new sanctions in response to Iran’s sponsorship of terrorism and efforts to destabilize the Middle East, especially in Syria, Iraq and Yemen. Unlike the JCPOA, which was negotiated with no input from America’s allies in the Middle East, Ambassador Bolton outlines a multilateral campaign to forge a new comprehensive approach to the threat from Iran that includes the Gulf States and Israel to assure that their security interests are taken into account. We agree with Ambassador John Bolton that strong international sanctions, a tough negotiating strategy and a decisive American president who will not engage in appeasement is the best approach to rein in Iran’s belligerent behavior and induce it to joining negotiations on a better agreement. As national security experts who understand the urgency of addressing the growing threat from Iran, we urge you to implement the Bolton plan, withdraw from the dangerous Iran nuclear deal and not certify Iranian compliance to Congress next month. It is time to move beyond President Obama’s appeasement of Iran and to begin work on a comprehensive new approach that fully addresses the menace that the Iranian regime increasingly poses to American and international security. Brigadier General, USAF (Ret.). President/CEO, IN-Cyber Vision, Inc.
Vice Admiral Robert R. Monroe, U.S. Navy (Ret.). Senior analyst, National Institute for Public Policy. Former Senior Director for Forces Policy and Principal Director for Strategic Defense, Space and Verification Policy, Office of the Secretary of Defense. Former Senior Foreign Service Officer. The Trump Administration is required to certify to Congress every 90 days that Iran is complying with the July 2015 nuclear deal (the Joint Comprehensive Plan of Action — JCPOA), and that this agreement is in the national-security interest of the United States.1 While a comprehensive Iranian policy review is currently underway, America’s Iran policy should not be frozen. The JCPOA is a threat to U.S. national-security interests, growing more serious by the day. If the President decides to abrogate the JCPOA, a comprehensive plan must be developed and executed to build domestic and international support for the new policy. Even the previous Administration knew the JCPOA was so disadvantageous to the United States that it feared to submit the agreement for Senate ratification. Moreover, key American allies in the Middle East directly affected by this agreement, especially Israel and the Gulf states, did not have their legitimate interests adequately taken into account. The explanation must also demonstrate the linkage between Iran and North Korea. 1. Early, quiet consultations with key players such as the U.K., France, Germany, Israel, and Saudi Arabia, to tell them we are going to abrogate the deal based on outright violations and other unacceptable Iranian behavior, and seek their input. 2. Prepare the documented strategic case for withdrawal through a detailed white paper (including declassified intelligence as appropriate) explaining why the deal is harmful to U.S. national interests, how Iran has violated it, and why Iran’s behavior more broadly has only worsened since the deal was agreed. It is critical that a worldwide effort be initiated to inform our allies, partners, and others about Iran’s unacceptable behavior. While this effort could well leak to the press, it is nonetheless critical that we inform and consult with our allies and partners at the earliest possible moment, and, where appropriate, build into our effort their concerns and suggestions. This quiet effort will articulate the nature and details of the violations and the type of relationship the U.S. foresees in the future, thereby laying the foundation for imposing new sanctions barring the transfer of nuclear and missile technology or dual use technology to Iran. With Israel and selected others, we will discuss military options. With others in the Gulf region, we can also discuss means to address their concerns from Iran’s menacing behavior. The advance consultations could begin with private calls by the President, followed by more extensive discussions in capitals by senior Administration envoys. Promptly elaborating a comprehensive tactical diplomatic plan should be a high priority. The White House, coordinating all other relevant Federal agencies, must forcefully articulate the strong case regarding U.S. national-security interests. The effort should produce a “white paper” that will be the starting point for the diplomatic and domestic discussion of the Administration decision to abrogate the JCPOA, and why Iran must be denied access to nuclear technology indefinitely. The white paper should be an unclassified, written statement of the Administration’s case, prepared faultlessly, with scrupulous attention to accuracy and candor. It should not be limited to the inadequacies of the JCPOA as written, or Iran’s violations, but cover the entire range of Iran’s continuing unacceptable international behavior. * Actively organize opposition to Iranian political objectives in the U.N.
1. Although this paper will refer to “the JCPOA,” the abrogation decision should also encompass the July 14, 2015, statement by the Security Council’s five permanent members and Germany, attached as Annex B to Security Council Resolution 2231. The JCPOA is attached as Annex A to Resolution 2231.